Chimborazo tells a story, a fairly stunning story that started with the birth of science in the pre-Greek era and went through Galileo in 17th Century and onto Robert Hooke who suggested that gravitational forces are dependant on the an inverse square of the distant. As a result Sir Isaac Newton managed to derive mathematical proofs of Kepler’s law’s of planetary motion. That simple theory was used to predict that there was yet another planet in our solar system Neptune, as the behaviour observed by Uranus could not be accounted for by the other planets. There was one other thing that his theory suggested that it might be possible to weight the earth with a suitable mountain, although Newton dismisses it fairly abruptly towards the end of his magnum opus. To scientist who pawed over Principia looking for ways to out smart the smart guy, this was a red rag to a bull. In 1738 having set out from France to try to measure the meridian arc length of one degree of latitude near the equator two French astronomers Pierre Bouger and Charles Marie de La Condamine took advantage of the opportunity to carry out what has been called the ‘deflection experiment’ on a Chimborazo that was over 6km tall and more than 20km across. Chimborazo is also the furthest point from the centre of the earth, which would make you think that it is higher than Everest. However the earth not only bulges with land and sea mass about the equator making Chimborazo just over 20000ft or 6268 metres above sea level. The other reason it is easier to climb it that compared with say Mount McKinley in Alaska, that is 100m smaller, is air is much more rarefied at altitude the further you journey from the equator as the atmosphere also bulges around the equator. Whilst the deflection experiment ultimately failed to produce decent result, they did conclude that the mountain was not an empty sphere. Perhaps the first real proof that this was the case. The first successful deflection experiment was to take place thousands of miles away in Scotland on the edge of Rannoch Mor in the Highlands. But I’ll save that story for another time. In researching that story about Chimborazo I stumbled upon two huts on the mountain named Refugio Carrel and Whymper. Now most people will know the name Whymper but Carrel requires a much greater knowledge of the history of race for the first ascent of the Matterhorn. 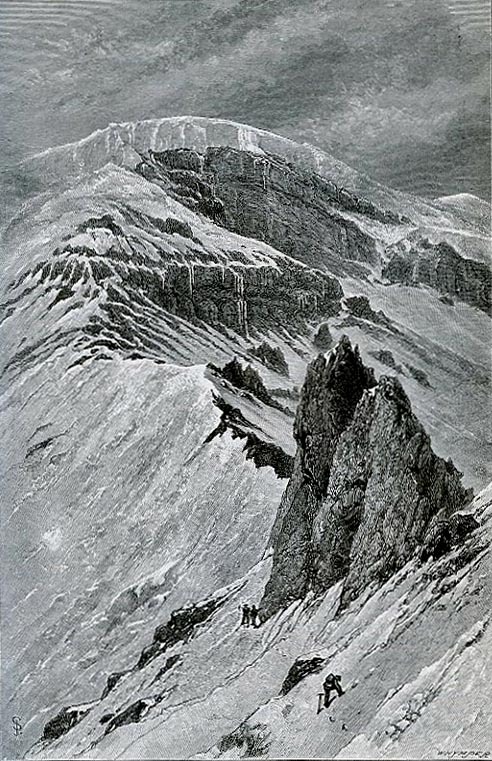 Having myself fallen down that rabbit hole, I know that Whymper’s rival for the crown of the golden age of alpine mountaineering by being the first to stand upon the summit of the impossible mountain, was none other than Jean-Antione Carrel. Instantly I was intrigued, the pair had such a clash of personalities leading up to the first ascent of the Matterhorn that it seemed inconceivable that they should team up on this or any other mountain. So I delved into the story of Chimborazo to see if I could conclude my story of Whymper and Carrel. Whymper’s immediate plan after the tragedy on the Matterhorn in 1865 was to test the route finding skills he practiced in the two seasons leading up to the successful ascent of the Matterhorn in Greenland. In 1867 he set about exploring the interior and made some reasonable advancements in how to approach Arctic Exploration years ahead of and potentially paving the way for Shackleton and Scott, returning again in 1872 to explore the coastline. Whymper was a man who liked to make plans and his infamy probably helped opened many doors in Mountaineering, especially after his publication of Scrambles Amongst the Alps in 1871, which gave a full account of the Matterhorn, albeit from his defensive perspective. Having read his and many contemporary accounts I made various conclusions about him and his relationship with guides during the whole Matterhorn saga. He refers to them as ‘mere pointers out of paths’ and consumers of vast quantities of food and wine. He was double crossed on more than one occasion by Jean-Antoine Carrel, yet it transpires that when he was planning a trip to Ecuador he managed to get his rival to not only sign up, but come willingly. His account of climbing nearly all of the Ecuadorian Volcanoes is captured in his later book Travels Amongst the Great Andes of the Equator. The book was not published until 1892, but his journey in the region started on Decemeber 9th 1879. Whilst he was obviously interested in making some first ascents having read accounts of Humbolt, one of the great naturalist who explored Latin America at the turn of the 1800’s, who had himself made an early attempt at Chimborazo. Whymper’s main emphasis of this journey was to explore a new phenomenon that was only just starting to be understood, that of altitude. An etching from Whymper’s book Travel’s Amongst the Great Andes of the Equator- where he tells the story of Chimborazo. Indeed his whole introduction is about the scientific measurement and questions he wants to answer like can life be sustained at great altitude. Perhaps the earliest hint of a ‘death zone’, that had come about from early hot air balloon flights that ended in the deaths of their passengers. Two bits of that stand out, firstly that no one knew if any ill effects would have a permanent effect on you, and that last section which generally asks if after a period of time at a set height you can acclimatize to it. It was this seemingly foolhardy human experiment that Whymper had gotten the two Carrel’s to sign up on. Although he did so by hiding the real nature of the trip and what might befall them simple by saying, “we should proceed to South America, and that they would be employed in mountain work, at great altitude”. It would appear from the text that Whymper had changed, his experiences on and since the Matterhorn with guides and local indigenous people around the world had perhaps humbled him. What it meant in practice was he had found better and more successful ways to get people to do his biding. An example of this was as part of his experiments’ he wish to spend a night on the summit of Cotopaxi, but felt that he could not get Carrel to agree to such an idea so instead suggested it would be great to see one of the famous eruptions close up at night. Sowing the seed in Carrel’s mind, it grew until one day he turned round to Whymper and said “You have raised within me a great desire to look into this animal”. What this meant was that he had a much more successful trip with Carrel and the locals. His experiments relied on him knowing the pressure and elevation he was at and in kind of a throwback to the pre-mountaineering for it own sake age, Whymper resorted to the bygone era of carrying barometers. Knowing that they were prone to breakage he devised a better way to carry his mercurial barometers, had several aneroid barometers and boiling point thermometers as back ups. The thermometers are most interesting as a reduction in pressure means that water boils at a lower temperature. Know the temperature at which the water boiled could therefore indicate pressure and as a knock on effect altitude. He took all three methods and he conducted painstaking comparisons between them, showing that the aneroid barometers were quite unreliable despite being recommended. He later went on to publish a pamphlet on their use and even suggested design changes to make them more reliable. Today we can address this by a whole manner of medications, Asprin can simply help to relieve the headache, or we can turn to Diamox to help us acclimatize more quickly. Whymper was experimenting with Chlorate of Potass, which was suppose to help treat mountain sickness. Whilst I am unsure if they mean potassium Chlorate or Chloride, the difference is vitally important, one is poisonous, whilst the other helps improve the potassium levels in blood, but in high enough levels it can also slow down the heart. Its ability to do that means it is used as part of a three drug combination in lethal injections. Either way I am not convinced and nor was Jean-Antoine Carrel of their efficacy, instead he relied on his one solution for virtually every form of illness, red wine. Given the recovery rates on the three of them, red wine would have appeared to be the winner of this test. As they recovered Whymper sent his guides out to recce the route and after returning at a point of near exhaustion they went instantly to sleep. The follow day Carrel senior declared ‘the thing is certain’ and shortly after established a third camp at 17450 metres. Whymper’s grave in Chamonix. Close to the hotel in which he died. A few days later back up the mountain they left the high camp at 5.40am on the 4th January making their way to what they believed to be the summit. After hours of hard work they arrived at this false summit at 3.45pm and then had to descend slightly to make a second arduous crawl up loose snow to the proper summit. Where despite a strong winds Whymper took his all important barometer readings, no doubt resulting in the lowest ever reading of the time. They descended quickly and Louis Carrel showed signs of fatigue as he descended, nearly tripping over his feet. Only the following day did he reveal that his feet were frostbitten. Along with Whymper’s own hands, after he removed his gloves to use the metal barometer. After a period of rest, Whymper and this team successfully climbed all the greatest Ecuadorian peaks. 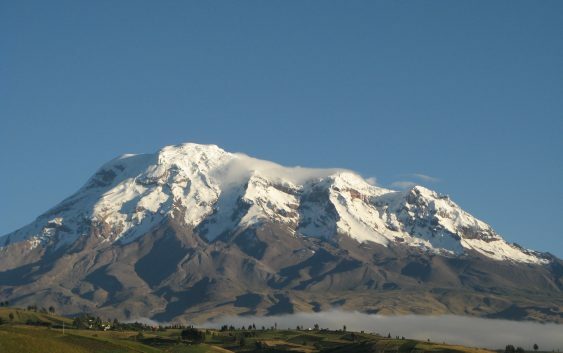 Returning to Chimborazo again, in part to dispel a few rumours that he had not climbed the peak, but also to climb it from a different direction with two Ecuadorian nationals. Whymper was very much the same, obsessed by the mountains to the end. On 12th September 1911 he had just returned to Chamonix from a climb, where upon he became ill and locked himself in his room at the Grand Hotel Couttet, four days later he died alone. 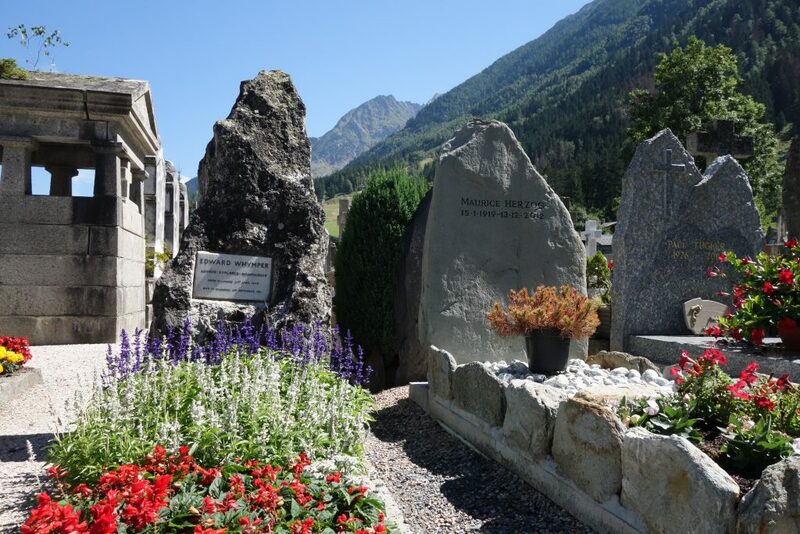 He was buried in the town where upon two guides knocked on the door of every house in Chamonix and asked residents to attend his funeral where Mountain Guides carried his coffin. It has been noted that if it were possible to see from within their own grave, then Whymper would have one of the finest views of Mont Blanc.